From January 28th to the 30th, I participated in a week of solidarity with refugees in Sudbury. Father David Shulist, SJ, Director of Spiritual Services at the University St. Ignatius Parish, had invited me to be a part of this week and help raise awareness about refugees and their experiences. I gladly accepted. 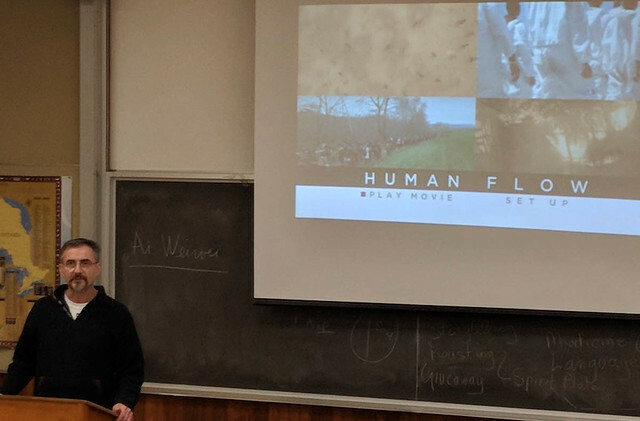 We kicked off the week with a showing of “Human Flow”, a documentary film produced by Ai Weiwei. It is a powerful film with few words but with striking images that depict the refugees’ plight and their humanity. One cannot remain indifferent after seeing such a film. The next evening, I was part of a panel of 4 people who were invited to share their knowledge and experience regarding refugees. The title of the Round Table was “Canadians, Refugees & Migrants Now: The Challenge of Sharing the Journey”. The first speaker was Tara Hurford from Development & Peace who gave us some startling numbers regarding forced displacement and challenged us to follow the Catholic principle of “See – Judge – Act” in order to get to the root causes of this forced displacement. Anas Karzaï, a sociology professor from Laurentian University who is personally and professionally committed to the cause of forced migration, followed up with a brilliant analysis of the root causes of forced displacement. In 20 minutes, he managed to explain how Western countries, led by the United States, have divided the world into an “us” vs. “them” mentality since 9/11. If our way is good and theirs isn’t, we tend to impose ours which justifies military intervention and continues to feed our military economy. And all of this to maintain our world dominance by continuing to extract resources from the Global South. I then spoke on how fear drives us to reject the stranger, the refugee. We therefore need to cultivate compassion, love and empathy to overcome this fear. But we can only do it by befriending the other, by walking by his side. Finally, Sara Torres, a social work professor from Laurentian University who does research on migration in Canada, finished the panelists’ presentations with a talk on the experience of migrant children and their parents in the face of the Child Welfare System in Canada. The lack of cultural sensitivity can lead to devastating consequences for refugee families in Canada. After the panelists finished their talks, it was the audience’s turn. Members of the audience asked questions and we were able to go deeper into the root causes of forced displacement and the importance of welcoming and accompanying refugees when they do make it to Canada. The next day, I facilitated the simulation exercise “A Journey into Exile”. Nineteen people participated and “became refugees” for 90 minutes. They experienced forced displacement and had to make decisions, sometimes quickly, that would have a lasting impact on their lives. After their 90-minute experience, we had a rich discussion on the reality of refugees’ lives, the difficulties they face daily, but also the resilience they have in the face of all that adversity. I left Sudbury thinking: Mission accomplished. Many thanks to the organizers of this solidarity week, Father David Shulist, SJ and Lucien Pelletier, who put the time and energy required to make this a successful event.